Explore the Music City with the ultimate Attraction Pass. Our Nashville Music Attraction Discount Pass is your ticket into music history of Nashville and so much more. You will have entry into 4 amazing attractions in Nashville including the Ryman Auditorium, Johnny Cash Museum, Historic RCA Studio B and the world famous Country Music Hall of Fame. Leaving Nashville knowing you experienced and walked in the shoes of Nashville's elite. *Passes purchased for a 2019 travel date will also include entry to Madame Tussauds Wax Museum. When you step into the Country Music Hall of Fame and Museum you will be embarking on a trip through decades of country music history! The architecturally stunning building stretches over a block of Nashville and features exhibits sure to thrill any fan of the genre. A towering wall of honor features gold and silver platinum records as well as exhibits dedicated to the trail-blazers and legends of country music who have been inducted into the Hall of Fame. Once the recording house of popular music titans such as Elvis Presley, Chet Atkins and the Everly Brothers, the studio's interior has been restored to it's original 1957 appearance. Hit makers in Studio B have included Bobby Bare, Dolly Parton, Willie Nelson and Floyd Cramer among others. 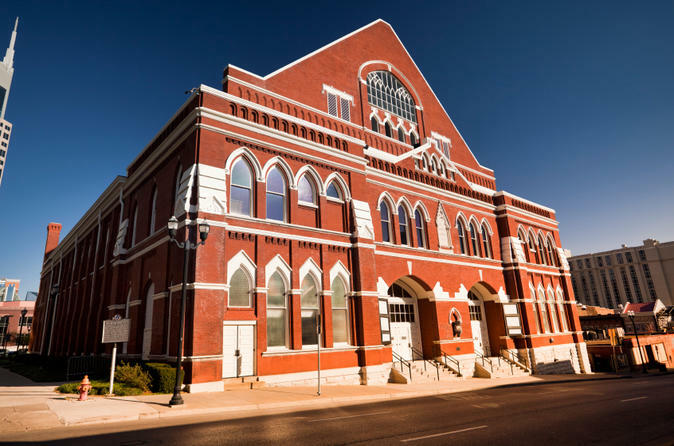 Explore the coveted halls of the Ryman Auditorium, home to the Grand Ole Opry for more than 30 years, when you enjoy a self-guided tour of the famous venue. Begin by sitting in the original pews and viewing a short film narrated by Trisha Yearwood. "If These Walls Could Talk." After the film, head to the legendary stage and stand beneath the lights to have your photo taken "singing" in front of the Grand Ole Opry audience. The museum is officially authorized by the Estate of Johnny Cash and features the largest collection of Johnny Cash artifacts and memorabilia in the world. The comprehensive selection includes state of the art exhibits of the music legend, a gift store, and special event that make this the ultimate Johnny Cash venue to see! Located in the heart of the Historic District, Hard Rock Cafe is considered one of the city's premier dining and entertainment destinations. The cafe has a 378-seat restaurant, an open air terrace, a Hard Rock souvenir shop, and a state-of -the-art live concert venue. You will receive a $15 voucher to spend on food, beverages, and souvenirs as you enjoy rocking Nashville vibe. Explore Tennessee's largest outlet with over 200 stores, dining locations including full-service and quick and fast options, and entertainment options including IMAX and Regal Cinemas. Take your voucher to the customer service desk to redeem your free Opry Mills Outlet coupon book and receive discounts for your ultimate shopping experience. Honoring Nashville, Madame Tussauds features iconic stars from the world's top country, rock, pop, jazz and blues artists. This world-renowned wax attraction is now opened at its newest location at Opry Mills.